Written by William Lee, a new contributor to the website. First home game opener for the Chicago Bulls, after losing to the Miami Heat on their ring night ceremony, opening day game of the NBA. The fans were excited to see their hometown hero Derrick Rose return to action, waiting to explode after Rose’s first made shot. Although Rose continued to show rust, shooting only 2-11 from the field in the first half. The only time Rose scored in the first half, was off of two consecutive Metta World Peace bad forced up shots, which led to consecutive Derrick Rose lay ups on the fast break. The game was played at the Bulls pace, a slow, grind it out, defensive game, with the Knicks finishing the game on 36% shooting, while the Bulls didn’t fare much better, at 40% shooting. Luol Deng was off to a quick start with 8 points in the first quarter. The Bulls closed out the quarter on a 10-3 run when Tyson Chandler was subbed out of the game for Amare Stoudemire, leading to a 10 point lead for the Bulls at the end of one, 26-16. Carlos Boozer had 6 of the 10 points during the run, all with Stoudemire guarding him (that was putting it kindly). To compound this issue, Amare did his typical Amare thing, dribbling the ball off his own leg, after doing a spin move. The first quarter was topped off by a Taj Gibson offensive rebound, and put back, after Kirk Hinrich put up a desperation shot. The Knicks continued to struggle with turnovers, after finishing the previous year first in turnovers. The first half of the game looked to be a repeat of the 22 turnovers in first game against the Milwaukee Bucks. The Knicks had six turnovers in the first quarter, finishing with a total of 13 turnovers in the first half. Andrea Bargnani highlighted this, when he committed consecutive offensive fouls early in the second quarter. Trying to set up a screen on the first one foul, and then on a post up play on the following Knicks’ possession. Shortly after, he committed a third offensive foul, while trying again to set up a screen. Even though the Knicks shot terrible in the first half, going 14-41 from the field, .341%, the Knicks stayed in the game with their three point shooting, going 4-9 from long distance. The Bulls on the other hand was 0-6 on three point shooting, which helped keep the Knicks in the game. The Bulls controlled the pace by constantly attacking the paint, with amazing high low passes from the bigs, with 34 points in the point at the half. While also playing great defense, which led to optimistic offense by the Bulls, who had ten fast break points in the second quarter. Derrick Rose started off the second half with back to back threes, pushing the Bulls half time lead to nine, 49-40. Andrea Bargnani played his best quarter so far as a Knick, in the third quarter, going 4-6 from the field, including a 3 pointer. This was not enough, as the Bulls went on a 9-0 run midway through the third quarter. One particular play summed up the night, as Carmelo Anthony took a quick, bad shot, which led to a Derrick Rose lay up, on the other end. 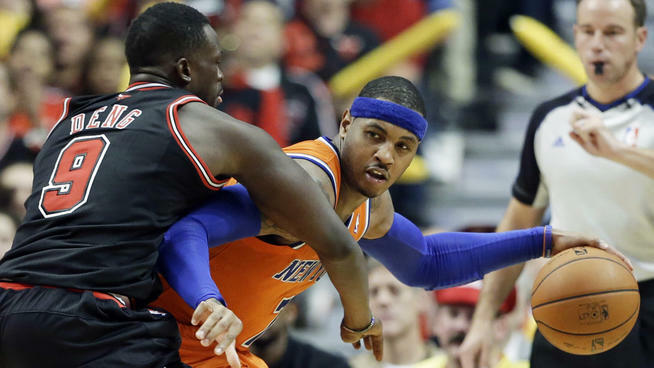 Even though the Knicks didn’t commit a single turnover in the third quarter, the Bulls were still able to continue extend their led, getting it up to ten by the end of the third quarter, with a score Bulls 71-61. Things looked bleak for the Knicks when Metta World Peace committed a bailout foul on Jimmy Butler with two seconds left on the shot clock. This put the Knicks over the foul limit in the fourth quarter with 8: 46 to go in the game. On the following Knicks’ possession Artest (common he is called Ron Artest, Metta World Peace is just a ridiculous name) missed horribly wide right on a three point attempt, hitting glass…at this point the score was Chicago Bulls 74 – 66. The Knicks went on a 12-0 run, with Carmelo Anthony finger prints all over it. With a couple of made shots from Anthony, and a Felton three, which was made possible, by the Chicago Bulls defense being sucked into Anthony when he was the screener for Felton. Knicks led 78-76, Rose was fouled at 3:16, and tied the game up with his two free threes. Down the stretch The Knicks had terrible shot selections, with Raymond Felton taking an off balance shot from the free throw line, which led to a Tyson Chandler foul on Joakim Noah, while fighting for position for the rebound. Since the Knicks were already over the foul limit, this gave back the lead to the Bulls, with Noah making both of his free throws, the Bulls lead 80-78. Iman Shumpert then tied the game up, 80 all, with his free throws. With a minute to go, and Carmelo Anthony with the ball on the fast break, Noah did a great job picking him up Melo in transition, forcing him into a bad pass to Chandler, which sailed out of bounds. On the ensuing position Chandler stepped up on Rose attacking the paint, and Rose threw the ball out of bound. Carmelo Anthony then force up shot another bad shot (at the end of the game, it was the iso Carmelo Anthony show), Chandler drew a foul from Noah on box out for the rebound. However he was only able to make one out of two from the line, which left the door open for the Bulls, with only a one point lead for the Knicks 81-80. Rose then calmly closed that door, with a high floater over the outstretched arms of Tyson Chandler and Raymond Felton to give bulls the lead for good. With 5.7 seconds left the Knicks called a time out, and of course, it was an iso Melo play (*** “ let’s not ever run a real play” – Mike Woodson***) Melo misses, and the Bulls celebrate their first one of the season.